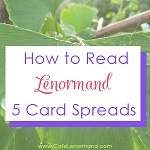 Need some help learning how to read a particular Lenormand spread? Stuck on what spread to use with your favorite deck? …or perhaps something on the Grand Tableau? 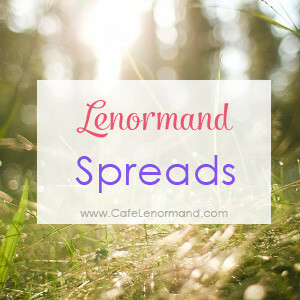 Here you can find all sorts of Lenormand spreads and tips on spread meanings. I will add to this list of Lenormand spreads as I post more spreads online. Be sure to bookmark this page and come back…or pin it to save for later. 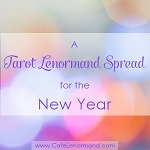 And if you ever get confused about which spread to use, check out this article: When to Use Which Lenormand Spread? Lenormand 3 Card Spread – A 3 card spread works well for all types of questions – love, relationships, career, pets, dailies – anything you can think of really. Lenormand 5 Card Spread – Just like a 3 card spread, a Lenormand 5 card spread can be used for all types of questions. The difference is in the detail. A 5 card spread simply gives you more information, insight and guidance. 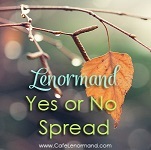 Lenormand Yes or No Spread – This spread is pretty self-explanatory. 🙂 It works for yes or no questions. Does he love me? Will I get the job? Will we get married? Just the kind of questions I'm sure many people asked Mlle Lenormand. Lenormand Grand Tableau Spread – The big daddy of them all. The Grand Tableau covers all aspects of your life – past, present, future, love, family relationships, friendships, work, health, and more. Nothing is left untouched. 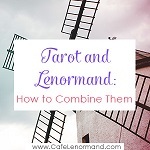 How to Combine Tarot and Lenormand in a Reading – This explains how to use the two different systems together and includes a love and relationship spread. A Tarot Lenormand Spread for the Year – This insightful Lenormand spread gives guidance for every month of the year. 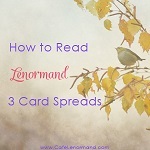 Best Spread to Learn Lenormand – Get advice on which spread is best for learning Lenormand and tips to help you in your studies. 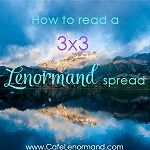 Lenormand 3×3 Spread – A great spread for a straightforward answer, a quick look at influencing factors, or a look into the near future. 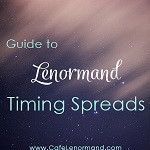 Lenormand Timing Spreads – Learn how to do Lenormand timing spreads.